Logan is the third and final film in the Wolverine movie series. Logan also sees a dramatic change in the tone of the movie. What you get with Logan is a much darker, much more somber Wolverine movie. After the success of Deadpool, 20th Century Fox decided to make the last Wolverine movie rated R. Something I believe should have been done from the first film. Wolverine isn’t a fluffy character. He has deep character issues. He is aggressive and violent. And his movies should have been produced that way. Logan is the Wolverine movie fans have been waiting for. Logan is also packed with leadership lessons. I always know WHO you are. It’s just sometimes I don’t recognize you. Professor Xavier, played once again by Patrick Stewart, laid this powerful line down to Logan. I took this to mean that he KNOWS who Logan is but he can’t always tell by his actions. What can you take away from this as a leader? People are looking for consistency in your actions to recognize you. You can talk the talk but without consistent actions, people won’t recognize you. In a gut-check moment, Charles Xavier told Logan, played by Hugh Jackman for the last time, that he felt Logan was a disappointment for what he has become. Logan wasn’t living up to his potential and Charles Xavier knew he had to tell Logan the truth. Sometimes the truth hurts. But we need to hear the truth. Don’t hold back when the truth needs to be told. Logan is set in the year 2029. This pushes the age of Logan upwards and, as such, his healing power isn’t what it used to be. He doesn’t heal as well and he has trouble getting around. Much like Logan, your leadership style can become ineffective. Your style may no longer work. Watch for this and change it up if you need to. Or you might need to pass the leadership baton. I don’t want to fight but there are some things we need to discuss. Caliban was scared to have a conversation with Logan. Yet he knew he must have a difficult conversation so he brought up the problems he was facing. Leadership conversations can get messy. People may even be scared to discuss situations with you. Be open to the conversations your team needs to have. Logan took the time to think through the issue at hand. It took him time to process what was happening. Don’t be afraid to take time to think. That’s something only you can do. Charles Xavier was weak and old in Logan. He couldn’t get around like he used to. During an attack by Pierce and the Reavers, Logan shielded Xavier from the attack. He put himself in the way of danger to protect someone else. This is what great leaders do. They put others first. They eat last. And they protect those on their team. After agreeing to care for Laura (also known as the comic book character X-23), played by the young Dafne Keen, he finds her shoplifting from a gas station. There, she steals a pair of colorful sunglasses. She could have picked out a black pair or another solid color. Oh no, she had to go and pick the most colorful pair of sunglasses that were available. What do you need to add some flair to? Find an area where you’re bland and spice it up a bit. Logan ripped into Laura for reading X-Men comic books. He believed those comics had altered the true story of the X-Men and made their lives seem safe. Charles spoke up and protested Logan’s berating of Laura. He knew the stories weren’t true to life. Still, he was okay with her reading them because of the escape from reality they provided. Life is rough in the real world as well. Your team members have faced some pretty messed up situations. They don’t need you to be breathing down their necks with threats. Logan was speaking to Laura as an adult. He wasn’t speaking her language. Leaders need to be aware of how they speak to other people. Are they speaking to them in their language or a language they can understand? Be sure to use the language of those you lead. This had to be my favorite exchange of dialog in the whole movie. This quote was also in the Logan trailer but that didn’t negate the power behind the quote. Logan didn’t want to help a couple who had been in an accident and their horses were now running in the road and put up the excuse someone else will come along. Xavier had the right heart. He knew someone HAD come along already. Logan. When you see a need, you need to act on the need. You’re there for a reason. Don’t be the person who leaves a person in need. During the same scene, we see Charles Xavier still has something to offer people. He used his mental powers to get the horses back to the trailer. While old, Xavier had value. The same goes for the older leaders in your life. They may be old but they can still offer leadership. Kathryn was someone who took Logan, Charles, and Laura in after being helped by the trio. She knew something that leaders need to realize: The Lord will provide. Yes, we need to do the work. Yet it will be the Lord who provides. This is what life looks like. People who love each other, our home. You should take a moment. Feel it. You still have time. Great leaders don’t forget what real life looks like. Life is having people around you. Family and friends. Find time for life. Xavier and Logan’s goal was to get Laura to Eden in North Dakota. After Xavier’s death, Logan told Laura he wasn’t going to North Dakota anymore. Laura wasn’t about to have any of that. She persisted in asking Logan to continue their journey. After awhile, Logan relented. Persistence pays off. You can’t expect to get results with only one action. You have to be persistent. Continue to push forward. Be persistent and put in the work day after day until your persistence pays off. Before Xavier’s death, he knew Logan wasn’t well. Logan wanted to end his life, possibly at the end of a gun barrel with an adamantium bullet. Xavier confided this to Laura and gave her a vision to see fulfilled: Save Logan. Don’t let Logan die. Great leaders provide a clear vision to others. They share the end goal and let them get to work in accomplishing the goal. Cast a vision others will latch onto. Logan never asked for the life he was given. He didn’t have a choice when adamantium was grafted to his skeleton. He didn’t ask to be the caretaker of Laura. His life wasn’t what he asked for. His life was what he was given. Great leaders recognize they don’t get what they ask for. They know they have to work with what they’ve been given in life. Don’t get upset when your life doesn’t look the way you want it to look. Live the life you’re given. Logan accomplished the goal of delivering Laura to Eden. One of the boys at Eden then proceeded to hand Logan the rest of the money he was promised. Logan turned down the money. He didn’t serve Laura because of the money. He served Laura because serving was the right thing to do. Why are you leading? Are you leading for the money? For the recognition? Or are you leading and serving because doing so is the right thing to do? Logan is to be Hugh Jackman’s last portrayal of Logan/Wolverine. Not only that, we see 2 major X-Men characters die. Both Charles Xavier and Logan are dead by the end of Logan. Seeing their deaths drive home a truth we don’t want to accept: We won’t be around forever. This means we won’t be leaders forever either. Our leadership is temporary, as is our lives. There were a lot of leadership lessons and quotes from Logan. You can walk away from Logan with a new take on leadership if you pay attention. Logan is also the best Wolverine movie released to date. But Logan is not without faults or warnings. Because of the R rating, Logan goes overboard in 2 areas. The first is the language is not for the faint of heart. The cast of Logan drops F-bombs like they’re handing out Halloween candy. The other issue was having a woman meaninglessly flash Logan as he was driving a limo. This action didn’t add anything to the movie and detracted from the story. If you can get over these 2 issues, Logan ranks as one of the top X-Men movies to date. Question: Have you seen Logan? If so, what was your favorite leadership lesson from Logan? 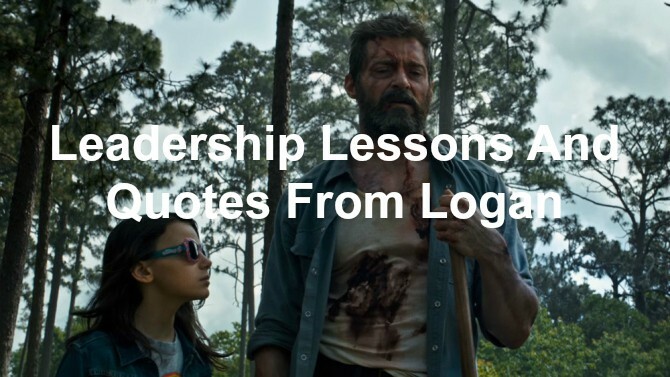 If not, what was your favorite leadership lesson or quote from Logan that I shared? Let me know in the comment section below.